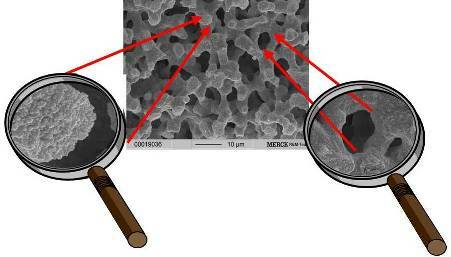 chromatography which contains two different sizes of the pores (mesopores, macropores). Monolith column uses monolithic silica gel as a separation media. and proteins by using a tabletop type small centrifuge or pipette in several ten seconds. �@　You can control the mesopores and macropores and silica skeleton size independently. �A　You can obtain high separation, low back pressure and easy operation at a same time. �B　We will aim to simplify and cost reduction of the separation process. 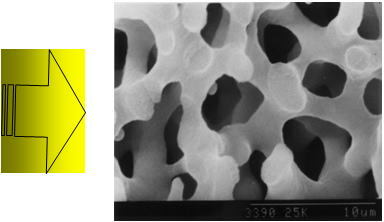 When you look at the cross-section of a monolith silica gel in the SEM photograph, you can see two types of pores, the nanometer (nm) size pores (mesopores) and micrometer (μm) size pores (macropores).